Nanotechnology basics: How does a carbon nanotube grow? (Nanowerk Spotlight) One of the best ways to gain control over synthesis of nanoparticles is to watch it happen. Take carbon nanotubes (CNTs): Synthesis of CNTs is a field that is growing explosively – but there is a lot that nanotechnology researchers don't know about how nanotubes form and grow. While there are a number of in situ characterization methods for nanotube synthesis under development worldwide, each with different strengths and weaknesses, much of the information about the nanotube structure is indirect. Historically, in situ characterization tools have accelerated progress in synthesis for many advanced materials, and there is widespread recognition that in situ tools have the potential to improve CNT synthesis as well. Ideally one would like to detect individual nanotubes and ensembles as they grow and measure their physical properties while imposing minimal constraints on the synthesis method. In other words, with a good understanding of the synthesis process we would be better able to control the product. Dr. Kazutomo Suenaga, who heads the Nanoscale Characterization Team at the AIST Carbon Center in Japan, explains to Nanowerk that soon after the discovery of single-walled CNTs (SWCNTs), a few possible pathways were proposed for the closed-cap growth of a SWCNT without any catalyst, where carbon clusters could be continuously incorporated into the carbon network of the tubes. "This growth model has never been experimentally observed because the whole reaction might be highly energetically unfavorable" says Suenaga. "One of the most important approaches is the inner growth of SWCNTs, which has been realized based on so-called peapod structures. By energetic irradiation or heating treatment, the fullerene molecules encapsulated inside the inner hollow cavity of a carbon nanotube could coalesce to form a new SWCNT, which is completed through the initial polymerization and the following series of Stone Wales (SW) transformations." He points out that, strictly speaking, this process is 'transformation' not real 'growth': "The fullerene cages are incorporated in whole, not in isolated carbon atoms and clusters. Besides this, it is rather difficult to investigate the dynamical transformation process since this experiment is hard to monitor, partially due to the short time-scale for SW transformations (in the range of nanoseconds or even faster)." To solve this drawback, Suenaga and JSPS Fellow Chuanhong Jin introduce an aboratively designed in situ high resolution (HR)-TEM method for the noncatalytic inner growth of SWCNTs. "By well controlling the supply of carbon feedstock through a thermally activated evaporation process, we were able to observe the evolution of a growing SWCNT, with particular attention paid to the following question: How does the cap of a carbon nanotube evolve during the growing process?" Jin explains to Nanowerk. 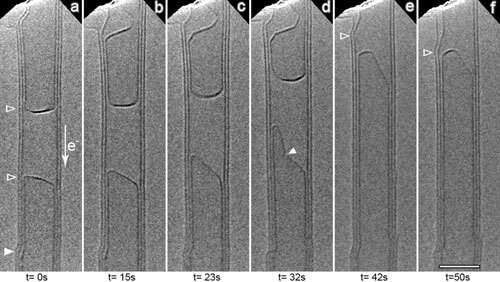 Jin is first author of a recent paper in ACS Nano where the AIST scientists present their in situ HR-TEM studies on the noncatalytic inner growth of SWCNTs, especially the evolution of the cap ("How Does A Carbon Nanotube Grow? An In Situ Investigation on the Cap Evolution"). "The cap of a SWCNT is surprisingly found to be kept closed during the growing process, because it was long believed that the cap should be open during the growth of SWCNT" says Jin. "The closed cap should be specific for non-catalytic growth of SWCNT. We also found the cap shape evolves inhomogeneously with a few particular sites growing faster during the growth." In this movie, the AIST scientists show the dynamical process of the catalyst-free inner growth of single-wall carbon nanotubes by in situ high resolution transmission electron microscopy. Suenaga and Jin explain that there has been a long-lasting discussion as to whether SWCNTs could grow with a closed cap through continuous carbon incorporation into the carbon network. While a few groups had proposed theoretical models for the closed growth, until now this has never been experimentally verified. "In our recent work, in the case of catalyst-free inner growth, our results clearly indicate that SWCNTs prefer to grow with a closed cap, especially for those with small diameters" says Suenaga. Besides the fundamental importance of understanding the formation mechanism of SWCNTs, which would improve the controllable production of SWCNTs and other related carbon nanostructures, the method presented by Suenaga and Jin should also be of importance for engineering the structure of inner shells of CNTs, such as 'defects repair' and 'cap modification', and this may be of great interest for electronic and optic applications. Suenaga and his team believe that it won't be long before scientists will be able to fully reveal – with atomic resolution – the elementary steps for the catalyst-free growth of SWCNTs through carbon incorporation into the carbon network of a CNT. In parallel, the group also shows a big interest in the catalyst-assisted growth of SWCNTs by addressing questions which will be of great importance on understanding the formation mechanism like how catalyst and carbon interact; which is the carbon diffusion path; and what is the nucleation process.